It is easy to view the driveway to your home as an afterthought, but you can turn it into a centerpiece, add some serious curb appeal to your home, and dramatically increase safety—all with some thoughtful choices. “The driveway is commonly overlooked,” but design options have grown in the past decade or so, says Michael Keenan, an adjunct assistant professor of landscape architecture at the University of Minnesota. How should you choose a type of material for your driveway? WarmlyYours Radiant looked at key design features of driveways in part one of this two-part series. In part two below we’ll specifically look at the different materials you or your designer can choose and how that impacts the cost, maintenance, and safety of the driveway. Your driveway material should fit the character of the house and the landscape. More importantly, depending on where you live, it should also stand up to heavy use.This can include snowplows, heavy water flow, road salt, fluids, such as oil and antifreeze, which leak from cars, extreme heat or dryness, and more. 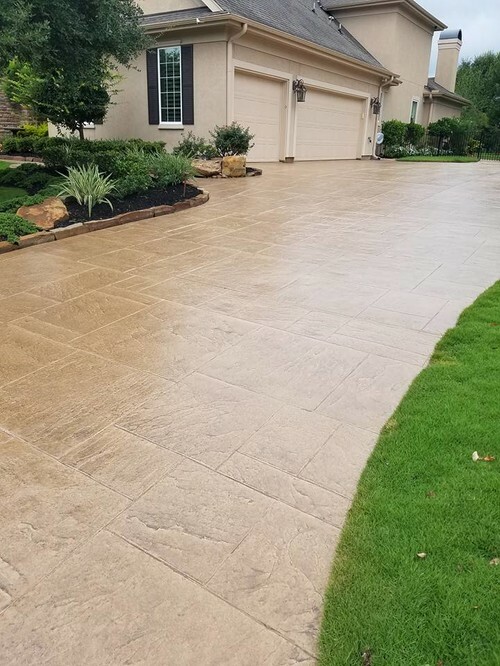 St. Louis, Mo., based Mosby Building Arts offers suggestions for driveway material selection in “How to Choose the Best Type of Driveway for Your Home. Popular options include pavers, permeable pavers, asphalt, porous asphalt, poured concrete, and stamped and stained concrete. These all range in installation prices, maintenance prices, and design possibilities (colors, patterns, etc.). 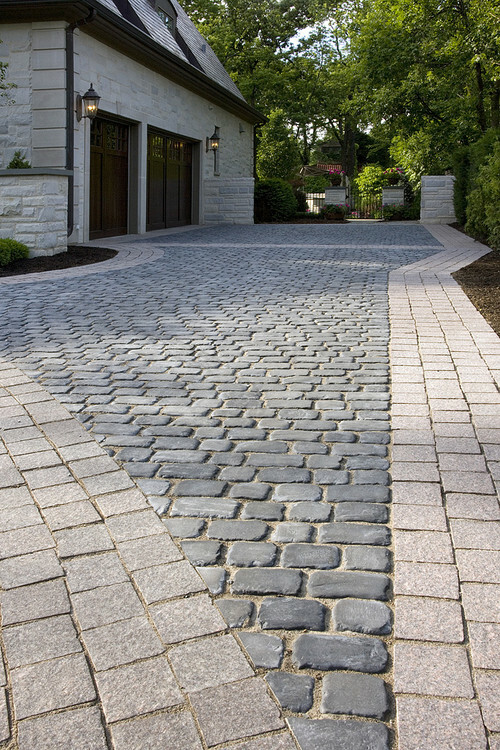 To find other not-so-common driveway materials, check out the slideshow, “10 Popular Driveway Options to Welcome You Home” from This Old House. Pavers, which start around $20 to $25 a square foot, are the most expensive investment due to material and labor costs, but the payoff is tremendous curb appeal and value. Pavers’ biggest benefit is that they should last a lifetime, Keenan says. “The key is the fact that the pavement acts as flexible fabric and it can move with the earth, and isn’t a rigid system and isn’t prone to cracking,” he adds. Pavers offer valuable design flexibility and aesthetic impact as well. “They come in a wide variety of materials including concrete, clay brick, cobblestone or natural stones. They can be laid in patterns only limited by your architect or designer’s creativity,” says Mosby Building Arts. There is a subset of the paver category known as permeable pavers.These help limit storm water runoff and increase the ability for water to run through a paved surface. In Naples, Fla., landscape architect W. Christian Busk installs driveways that feature real grass interspersed among pavers. 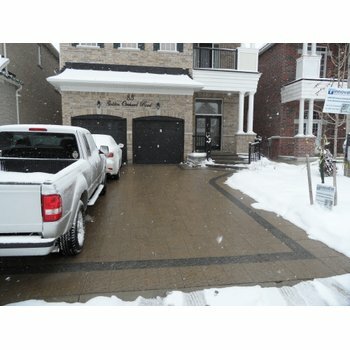 These “living driveways” reduce heat and glare and provides some drainage. Asphalt driveways also have a porous option. Using a special asphalt mix, water can drain through the pavement into a subgrade reservoir. “Porous asphalt can often be used to meet local impermeable surfaces codes and offer a good-looking surface that is easy to maintain,” according to the National Asphalt Pavement Association. In general, asphalt has the cheapest installation costs, although it needs resealing, which will cost more over time. “It is strong and durable. Read more on asphalt and its benefits here. Asphalt also lends itself readily to the types of service that are usual in residential areas, such as the repair of utility lines or any kind of wire that must be run under the driveway, the association points out. While poured concrete costs more than asphalt to install, when properly sealed it is more durable and requires less maintenance on your part. It is important to note that although concrete is more resilient and lasts longer, both asphalt and concrete will crack over time, Keenan says. Concrete really shines when it is stamped or stained, instantly adding character and individuality to your driveway. This option is also only limited by your creativity and imagination. “Stamped concrete is imprinted immediately after the pour using a polyurethane patterned tool. There are a variety of stamps available, which mimic a variety of materials including brick, flagstone, ashlar laid stone, slate, or wood patterns. For stained concrete, a base color is added to the cement mix and then accent or release colors are added to the surface after the slab is poured. The staining can be done before or after stamping depending on the type of installation you’ve chosen. Stained and stamped concrete should also be sealed to add life to the slab. Coordinate with your installer to choose the most compatible sealer for your needs,” describes Mosby Building Arts. Mosby Building Arts suggests that one luxury available with concrete is a radiant heating system can easily be installed at the time of the pour. “This extra investment can eliminate the need for snow and ice removal and create a safer driveway,” the company reports. At WarmlyYours, we couldn’t agree more. Our snow melting systems can be installed directly in concrete, asphalt, or in mortar underneath pavers, to keep your driveway (and patios, walkways, or stairs) both ice- and snow-free, creating greater safety and peace of mind during the winter months. These systems also help reduce or even eliminate the weathering and wear and tear that comes from shovels, snow plows, and de-icing solutions during the winter. By adding the system underneath during installation, you extend the life of the driveway, prolonging your investment. "The systems from WarmlyYours are available in cable format to allow for maximum flexibility or mat format for quick and easy installation"
“WarmlyYours can be installed in many surfaces. For asphalt driveways, our wire can go where water tubing cannot. Hot asphalt would melt hot water tubes, but WarmlyYours’ snow melting cable has a high-temperature resistant outer jacket that allows it to be installed right in the asphalt, saving install time and money,” points out Scott Rosenbaum, Manager, Technical Support and Engineering, WarmlyYours. If you are changing the material your driveway is made of, keep in mind that many cities will have codes requiring a permit. You’ll also need to work with your designer or contractor to determine if there are any building codes or state codes that must be followed. While pavers are the most expensive commonly used driveway material, asphalt driveways are the least expensive, costing approximately $12 to $15 a square foot. Concrete falls in the middle, costing about $14 to $18 a square foot, Keenan estimates. Keep in mind the easily overlooked long-term costs, however. “Asphalt has the lowest installation cost, though the price has gone up in the last several years as it is tied to oil prices,” says Mosby Building Arts. But asphalt is more high maintenance because it requires resealing every two to four years, which should be considered in the overall cost of the driveway. These are a few of the considerations you can make regarding the materials used in your driveways. Good luck combining style and safety in your driveway with your design choices. 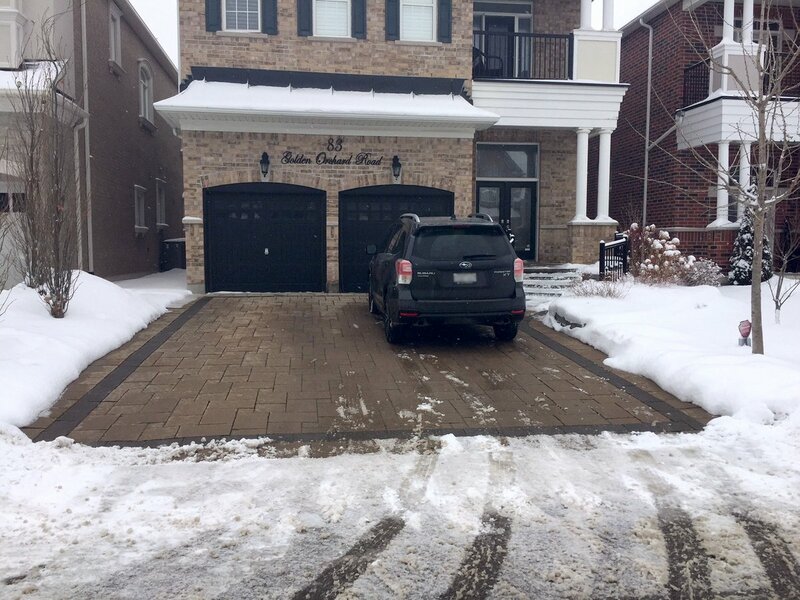 If you’ve already installed a WarmlyYours snow melting system under your driveway, then share your story, send us photos on the WarmlyYours Facebook page, or tweet us at @WarmlyYours.